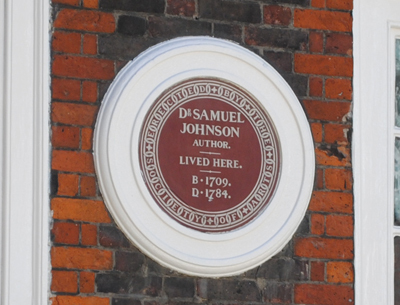 There is only one official blue plaque in the square miles of the City of London – that which marks the property of lexicographer Dr Samuel Johnson in Gough Square (he always did like to stand out from the crowd) – and, like many of the plaques in the scheme, it’s not even blue. The plaque was among the 35 erected in the first 35 years of the scheme – this one in 1876 – and was done so by the Society of Arts which then ran the scheme (later the Royal Society of Arts). In common with most of the first 35 plaques, it is brown in colour. In 1879, just three years after this plaque was erected, the Society of Arts came to an agreement with the Corporation of the City of London that the corporation – the governing body of the square mile – would commemorate sites of historic significance within its boundaries and the agreement has stood ever since. The hundreds of “blue plaques” since erected by the City of London Corporation are rectangular in nature and commemorate everything from structures like the long-gone historic gate of Aldgate (88 Aldgate High Street) to homes of the notable such as martyred Archbishop of Canterbury Thomas á Becket (86 Cheapside). There’s a searchable database of all the City of London plaques which can be found here. 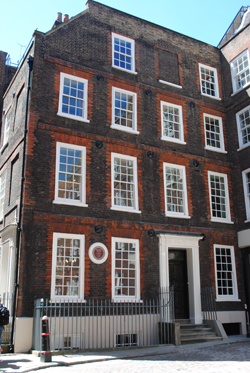 And, of course, Dr Johnson’s house, which he lived in from 1748-59 which compiling his famous A Dictionary of the English Language (the first comprehensive English language dictionary), is now a museum – for details of that, see our earlier post here. The searchable database of all the City of London plaques is a clever idea and so is the map. In the past I had to guess whether a recipient might have been important enough to get a blue gong, then guess where he might have lived.